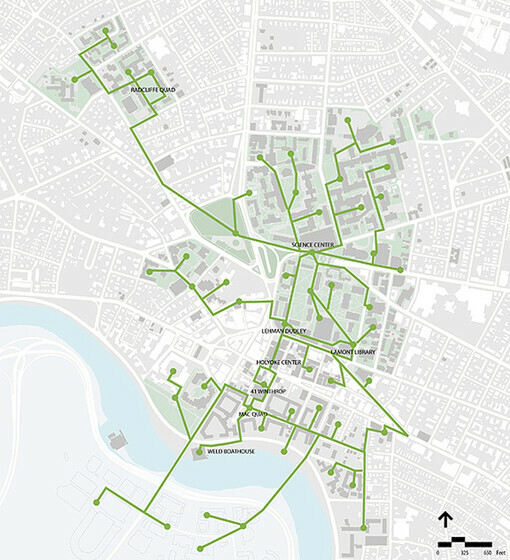 As part of an overall effort within Harvard University’s Green Campus Initiative, Atelier Ten proposed strategies to improve common spaces to enhance community connectivity through promoting environmental design. Starting with Harvard’s 2004 university adopted sustainability principles guiding new and existing buildings to meet the highest of environmental benchmarks, this initiative focused on improving the campus’s site and infrastructure issues. Atelier Ten helped to set targets and specific strategies to increase the functionality of Harvard’s eight most popular common spaces in terms of landscape, connectivity, water usage, energy generation, materials, and human comfort and environmental quality. Atelier Ten recommended ways that site and landscape could be better utilized to guide and achieve proposed sustainability benchmarks, through recommendations on ways to fundamentally reduce the environmental impact of the school, with improvements to the sites.